Youth unemployment is a major policy challenge throughout the world and it is especially pressing in urban areas, where high rates of joblessness feed widespread discontent, social tension, and political instability. As urbanisation accelerates, the problem of unemployed urban youth is going to become ever more pressing, especially in the developing world. Over half of the world’s population already lives in a city. By 2050, the urban population of Africa is expected to triple, while that of Asia is expected to grow by 61% (United Nations 2014). Many of these new urbanites will struggle to find satisfying employment. How can policymakers help young workers in large cities find jobs? The existing evidence is limited. While cash grants, public works programmes, and training schemes have had mixed results in this respect, a growing literature highlights the importance of job search costs and of informational asymmetries driven by young workers’ inability to signal their skills (Card et al 2007, Chetty 2008, Crépon et al 2013, Pallais 2014). So far, we have little knowledge of how these constraints can be alleviated, especially in developing countries. To fill this gap, we experimentally evaluate two interventions that are designed to help young urban dwellers search for employment by easing spatial and informational constraints to job search (Abebe et al 2016). The first intervention is a transport subsidy covering the cost of job search. In our study area, job seekers need to make regular trips to the centre of town to look for job opportunities. The subsidy was calibrated to cover the cost of this journey and could be collected from an office located in the centre of town (to ensure that jobseekers did not use it for other purposes). It was disbursed up to three times a week, for an average period of 16 weeks. The second intervention is a job application workshop, designed to improve job seekers’ ability to signal their skills to employers. Participants are offered orientation on how to make effective job applications using CVs and coverletters, and on how to approach job interviews. Further, during the event, participants take a mix of standardised personnel selection tests. We use the results of the tests to produce certificates that respondents can use in their job applications. We evaluate these programmes using a random sample of about 4,000 young individuals in a rapidly expanding metropolis located in a fast growing country – Addis Ababa, the capital of Ethiopia. This location is ideal for our purpose – a large city with a total population close to 4 million people, youth unemployment rates just below 30%, many insecure and poorly paid jobs, and rapid in-migration from outlying rural areas. We find that both interventions help jobseekers get better jobs. Eight months after the end of the programme, individuals invited to the job application workshop are nearly 40% more likely to have permanent employment and nearly 25% more likely to be in formal employment, compared to those in the control group. Individuals who are offered the transport subsidy are 25% more likely to be in formal employment. These effects are statistically significant; they are robust to a correction for multiple comparisons; and their magnitude is economically meaningful. The effects are stronger for women and for less educated workers (those who have at most secondary education). These are the groups that typically find it hardest to obtain high quality employment in Ethiopia and other developing countries (OECD 2015). To understand the mechanisms that drive these effects, we conduct fortnightly phone interviews with all sampled jobseekers throughout the course of the study. This provides a rich, high-frequency dataset that allows us to observe how search behaviour evolves in response to our interventions. 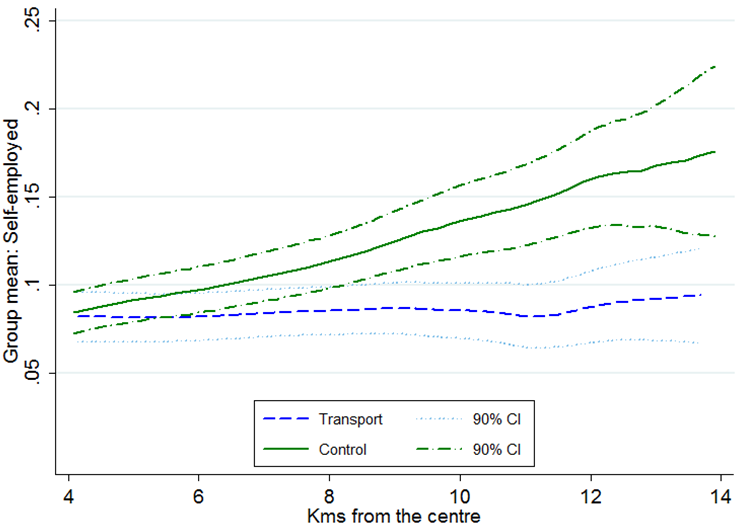 We find that the transport treatment improves employment by allowing young people to search more intensely for jobs (treated individuals visit the centre of town to look for work more frequently), as shown in Figure 1. Further, both the transport subsidies and the job application workshop improve the efficacy of job search (the conversion rate of applications into job interviews and offers increases). Notes: Impact of the transport treatment on job search by fortnight. 0 indicates the beginning of the treatment, fortnight 8 is when the transport subsidies ended. 95% confidence intervals are shown around the effect in each fortnight. The black line is a quadratic estimate of the treatment effect over time, starting from week 1, with a 95% confidence interval shown by the grey area. We also present strong evidence supporting the hypothesis that spatial and informational constraints matter for employment outcomes. In cities like Addis, good employment opportunities become scarcer the further workers’ live from the city centre. As a consequence, self-employment in the informal sector is more common on the outskirts of the city. Our interventions, particularly the transport subsidy, succeed in offsetting the tyranny of distance by increasing formal employment among workers who live further away from the centre (see Figure 2). Self-employment rates among these workers drop to levels similar to people living in the centre of the city thanks to the interventions. Notes: Probability of being self-employed as a function of distance from the city centre. In our sample, self-employment is typically an informal lower-quality alternative to salaried work. Further, the job application workshop is effective in mitigating the curse of anonymity. 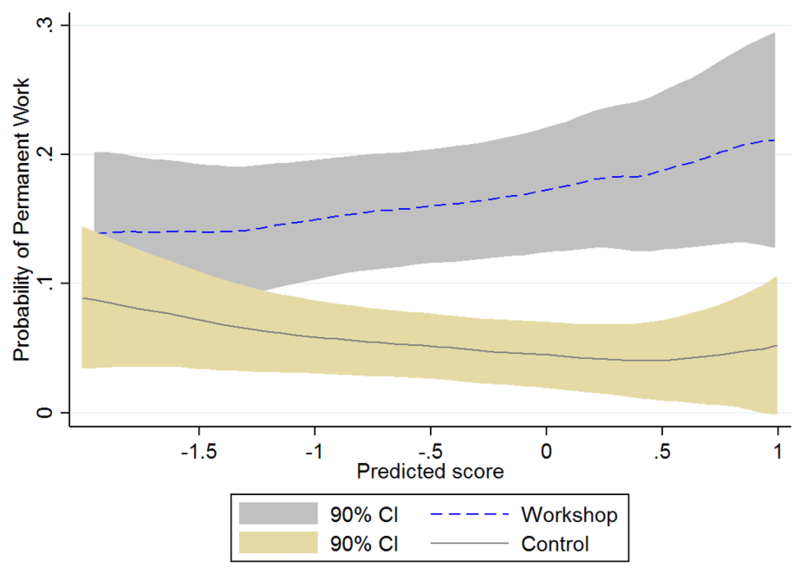 Using data from the personnel selection tests, we show that participating in the job application workshop strengthens the correlation between skills and good employment outcomes for workers with less formal qualifications (who, in the absence of the intervention, would find it hardest to signal their abilities). Notes: Probability of permanent work as a function of predicted grades in the personnel tests among workers without formal qualifications (i.e., at most a high-school degree). Young people throughout the world find it very hard to find the good jobs they aspire to. Our research helps us understand the challenges of job search and the possible remedies. In particular, it shows that many young workers are missing good opportunities due to disadvantages that policymakers can alleviate. The curse of anonymity and the tyranny of distance can be mitigated through simple interventions like transport subsidies and programmes that help jobseekers signal their abilities. Active labour market policies of this kind should receive greater attention from policymakers, especially in the developing world. Abebe, G, S Caria, M Fafchamps, P Falco, S Franklin and S Quinn (2016) “Curse of anonymity or tyranny of distance? The impacts of job-search support in urban Ethiopia”, NBER, Working Paper No 22409. Card, D, R Chetty and A Weber (2007) “Cash-on-hand and competing models of intertemporal behavior: New evidence from the labor market”, Quarterly Journal of Economics 122(4). Chetty, R (2008) “Moral hazard versus liquidity and optimal unemployment insurance”, Journal of political economy, 116(2): 173–234. Crépon, B, E Duflo, M Gurgand, R Rathelot and P Zamora (2013) “Do labor market policies have displacement effects? Evidence from a clustered randomized experiment”, The Quarterly Journal of Economics, 128(2): 531–580. Pallais, A (2014) “Inefficient hiring in entry-level labor markets”, The American Economic Review, 104(11): 3565–3599. United Nations (2014) World Urbanization Prospects 2014, United Nations Publications.